Iconic classical ballet Swan Lake will glide onto the stage at Milton Keynes Theatre next week when Northern Ballet returns to the venue. Adored by audiences for over a hundred years, there is in fact no definitive version of this dramatic ballet and choreographers the world over have put their own spin on the tale – some initially ruffling a few feathers in the process. Northern Ballet’s classy interpretation is described as a modern take on the treasured favourite. 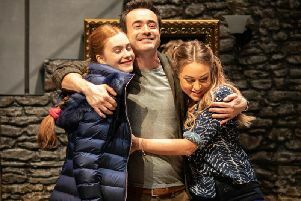 Sure to plunge theatregoers into the darkest depths of drama, the production is lovingly devised to stay true to the spirit of the story and, despite narrative changes, retains the essential elements that audiences expect. So, Tchaikovsky’s haunting score is played live by Northern Ballet Sinfonia, the famous dance of the four cygnets is a lakeside highlight and the strikingly powerful themes of romance and obsession endure. Artistic director David Nixon has reimaged the world’s favourite ballet as a tragic coming-of-age tale set in New England at the beginning of the twentieth century. A wealthy young man named Anthony is haunted by a childhood tragedy which resulted in his beloved brother drowning. As an adult, Anthony wrestles with romantic confusion and remains filled with agony and guilt over his sibling’s death. Determined to face the fear and attraction of the lake, Anthony looks to the water for answers. When Odette, an ethereal swan-like creature, surfaces, he experiences a rush of joy, freedom and comfort. Soon immersed in a love triangle with his two best friends, yet still bewitched by the memory of the mystical Odette, Anthony must face up to the turmoil and surrender himself to love. But who will he choose? Northern Ballet’s dancers blend classical ballet technique with contemporary flair and dramatic presence to bring well-loved stories from classical ballet, opera, literature and popular culture to life. Whether you are a bona fide balletomane or a relative newcomer to dance, Northern Ballet’s expressive Swan Lake promises to enthral and entertain. Dive into Northern Ballet’s Swan Lake at from Tuesday until Saturday April 30. To book call 0844 871 7652.